Do you have an Apple TV and at least one iOS device? Chances are you can run SketchParty TV and have a lot of fun for New Year's Eve or any group gathering. 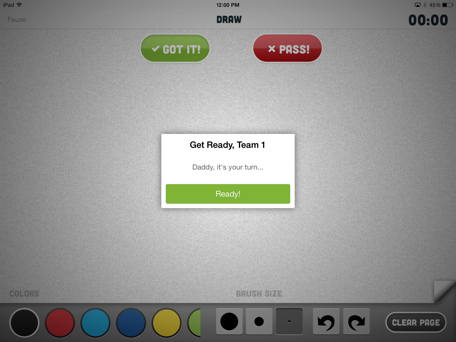 SketchParty is similar to classic Pictionary, where you draw something for your team to guess what word it represents. 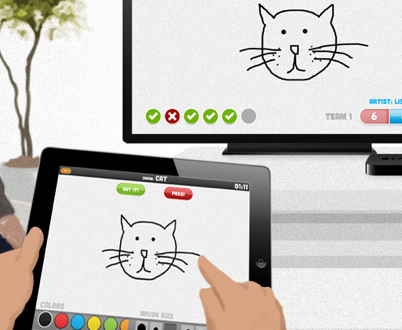 Except SketchParty TV uses AirPlay to project the game board on the TV while also showing the drawing screen you need to play on the iOS device (iPhone, iPod touch or iPad). It's ingenious, executed to perfection and a huge amount of fun for groups of four to sixteen. Setup couldn't be easier, provided you have no issues mirroring your iOS device display to an Apple TV. Once you've done that (and the help in the app is great), you'll want to enter the names of everyone playing, and set up teams. Four are needed for basic play, but up to a whopping 16 players can be split evenly among teams, each designated by a chosen color chip. As turns go around, the game specifies exactly who gets the iDevice next, something that I found really handy in larger groups. The game itself consists of one player seeing the secret word, then drawing the object on the screen for teammates to see. You have two minutes to try and get five words by default, but in options, you can set up to eight words per round, up to 90 seconds per round and up to four rounds per player. You can pass, but those show as a miss, which you'll try to make up later. Drawing is basic by design, but you do have a number of colors you can use, making it vastly simpler and less messy than traditional tabletop versions. This is where SketchParty TV really shines, by improving upon a real-world game by providing a compact, easy-to-use digital version. Meanwhile, my Wii U collects dust... There's also undo/redo, a few line sizes and a "clear page," which might be the only thing more fun to do in real life than digitally. I happened to use an iPad 3 and a second-generation Apple TV, but you can also use Apple AV connector or something like Reflector -- the main idea is you'll need TV out and an iDevice to use for drawing. A stylus isn't a bad idea, either. Everything about SketchParty TV is intuitive and easy to grasp, and the basic game is well known to many people. This is one of those games that's great for family get-togethers or parties. For a mere US$1.99, you can unlock custom word lists, which make the game even more fun, depending on how twisted you are. SketchParty TV at the time of this writing is on sale for $4.99, a huge discount from the normal $8.99. Even at $8.99, you're getting your money's worth, as a lot of tabletop games start at $12 or more. Do keep in mind the system requirements (iOS 7 being one of them), as with any innovative game. If you have a gift card burning a hole in your pocket and you love party games, SketchParty TV is a must-have for iOS. If you have an AirPlay-compatible device and Apple TV, prepare to wow your friends and family with a truly fun game for a terrific value. SketchParty TV, with its simple, but fun gameplay, outstanding design and polish, plus the tremendous value, is my favorite app of the year.